Blogger FTP Migration - Success! Whew! I have to tell you that I really sweated this one out. I wasn't sure that this migration from my own hosting center back to Blogger / Google hosting was really going to work with the upcoming FTP shutdown occurring on May 1st. The Agile Marketer has been around for about 4 years now - slowly climbing the SEO organic ladder (yes, I remember being one of the first guys to post on John Chow's site when he started it) nearing the top 10 list. I've been using this site for my personal opinions and learnings on how to make money online - making this site's Google ranking very, very important to me. What I wasn't sure about was that the ranking would drop and/or the migration would fail miserably. So, let's go through what I learned along the way and how easy or difficult this migration turned out to be. Let me backup a bit and describe my particular migration problem. The Agile Marketer site consists of a Blogger blog posts as the default landing pages with some ASP.NET scripts as side pages (for dynamic content such as the Free Affiliate Link Cloaker). 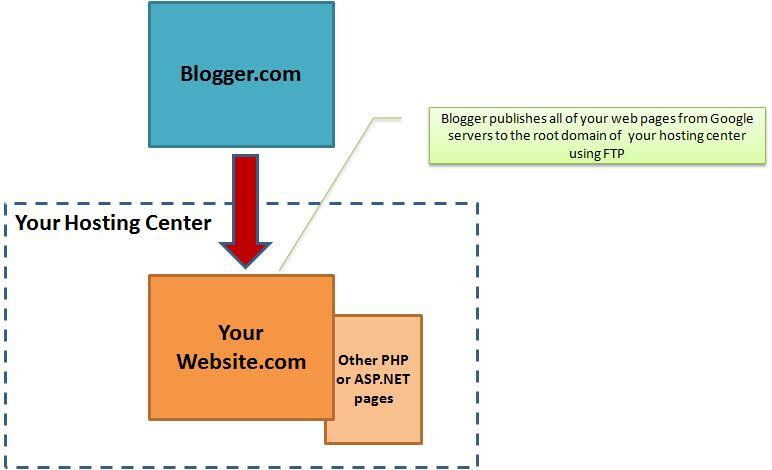 In this case Blogger FTP's all of the files to the root path of the domain (www.agilemarketer.com). Most people have a site blog that they publish to such as (www.agilemarketer.com/blog/) - but that was not my case. Step 1: Backup! Before I did anything, I FTP'd into my website at my hosting center and backed up all of my files. This is critical to do first - you don't want to lose any data if you make any mistakes. 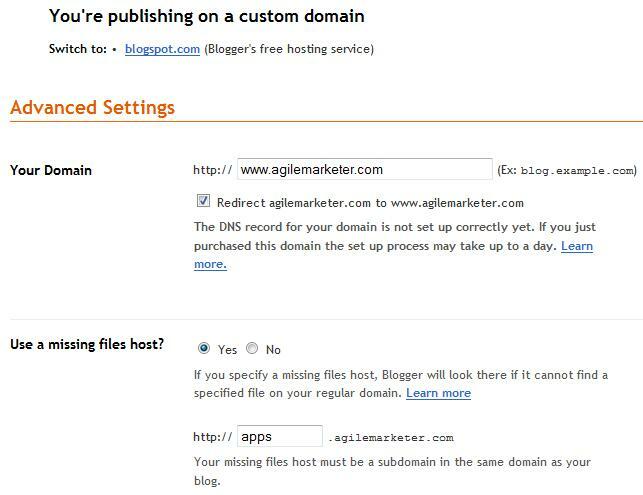 Step 2: Subdomain Creation: I had to go out to my hosting account and request a subdomain (apps.agilemarketer.com) to be created. Fortunately, I have full control so I had to eat one of my domains and created a new one with my control panel. Step 3: Copy Files: this is important! 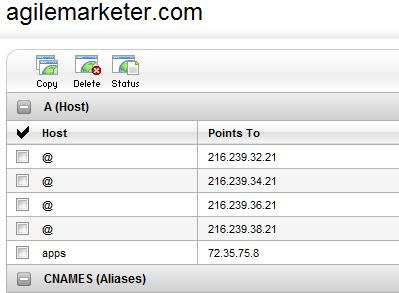 I then copied all of my site files from my root domain (www.agilemarketer.com) to the new subdomain (apps.agilemarketer.com) using a FTP tool. The key on this step is to have all of the files running successfully (PHP and ASP.NET scripts) on the subdomain. 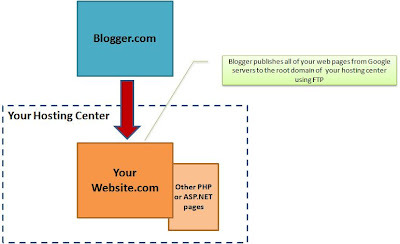 As you can see I also set the missing files host to apps.agilemarketer.com so that any FTP'd images in my blog posts would show up correctly. Now at this point nothing has really happened except any new posts on Blogger will not show up on my hosted site. I now have to point my DNS away from my hosting center to Google. 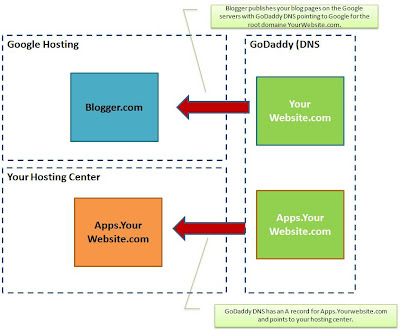 Step 5: Godaddy DNS: this was a bit tricky but I figured it out finally. 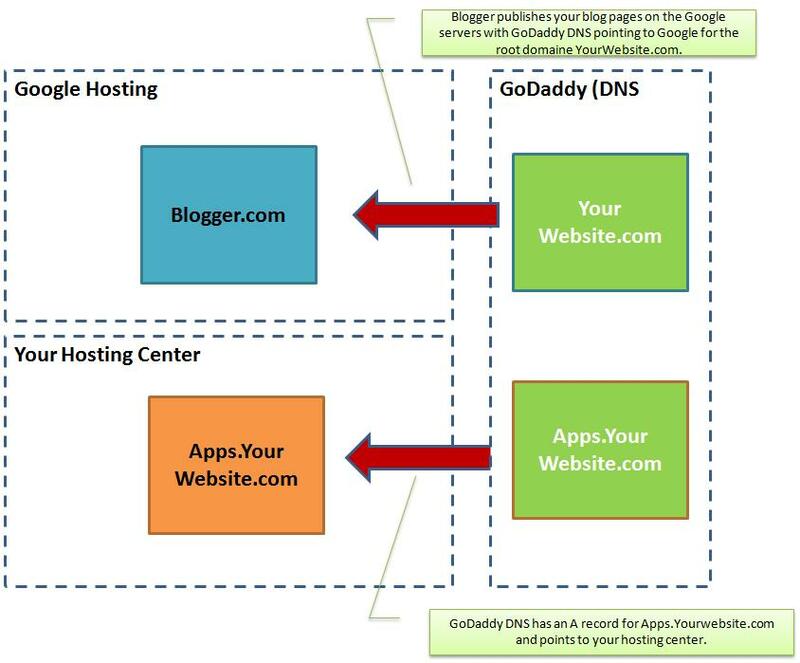 The main step here is to switch your Nameservers that point to your hosting center back to GoDaddy and use their Total DNS (this is not mandatory - you could use your hosting center's DNS). But, GoDaddy Total DNS is easier to work with than my hosting provider. And.......voila!!! It WORKED!!! Both domains are now working and I don't believe I lost any Google rankings in the process (I hope). All part of the education of trying to make a living online! Hope this helps anyone with the same situation. Nice article boy very helpful post for me great blog. I'm facing problem my site hosting but your article read then solve my problem thanks.